Brighouse Town made it two wins in three days, and extended their unbeaten run to five, with a 1-0 home win over Stocksbridge Park Steels last night. Ousman Cham got the goal after half an hour, knocking the ball into an empty net after the visiting keeper had parried Gabby Johnson’s excellent shot. 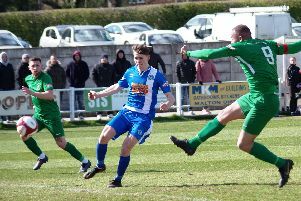 Victory came hard on the heels of Saturday’s 2-0 FA Trophy win at Glossop North End and lifted the Hove Edge outfit to third in the Evo-Stik NPL East section. Boss Vill Powell, whose side have 18 points from 10 games, will have been particularly pleased with a second successive clean sheet. Town have conceded only two goals in their unbeaten spell. Stamford are Brighouse’s next opponents in Lincolnshire on Saturday. They travel to Gresley tonight and are seventh in the table.